Salads are so overlooked, don’t you think? We focus so much on what to make for breakfast/lunch/dinner that we neglect an important precursor to the main meal. Having a salad before dinner is a must for me. But as good as it is for your health and taste buds, some of us can easily run into a salad rut. This salad, however, will make you fall in love with your vegetables all over again! This is a superfood zero calorie meal…I say zero even though quinoa has calories but who cares. I don’t count healthy ingredients as adding to my caloric intake. Writing that just made me think about my eating habits…. It was about time I started making my own version of her salad. I mean it was getting a tad embarrassing asking her to make me a salad every time we got together to eat. I can make my own salad damn it! I have a funny feeling she thought the same thing. I made it for the first time when I had my family over for dinner and it was a huge hit. It’s now a mandatory make at least once a week. 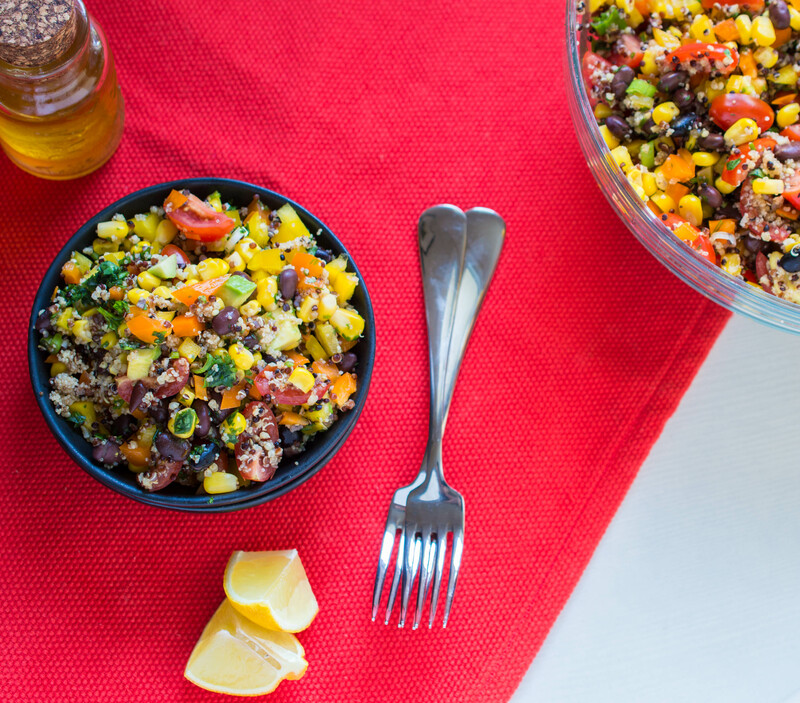 The best part is obviously how easy it is to whip up: cook quinoa, chop a few veggies, and dress it up with vinaigrette. That’s it. I decided to use red quinoa instead of white because I found that the red kept its bite after being cooked, therefore more enjoyable. 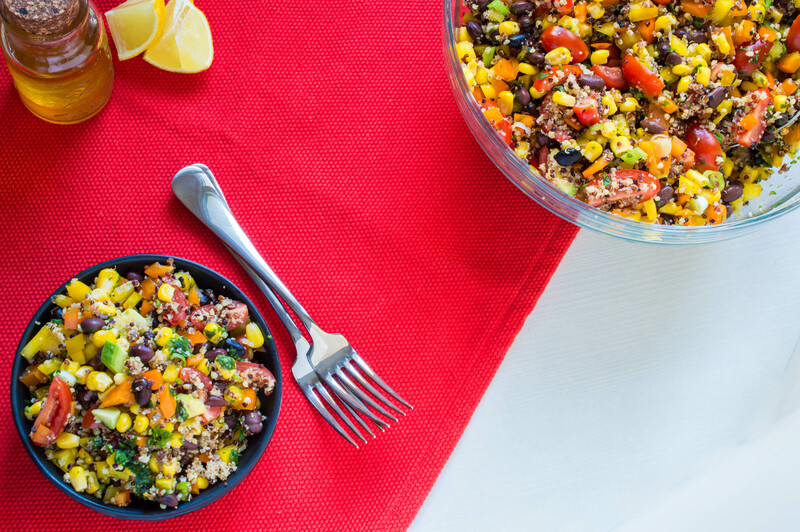 If red quinoa is hard to find, feel free to use white although it’ll render a fluffier texture, or try out a combination of red quinoa and other grains/seeds you find in a mix. 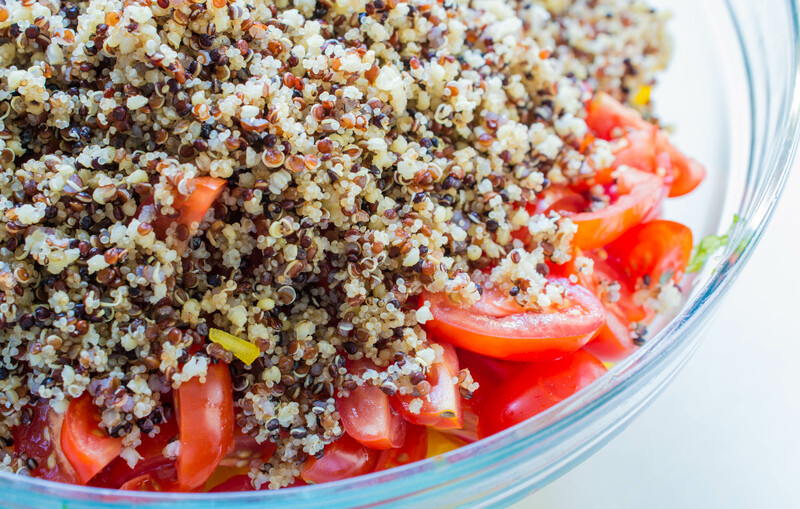 The salad pictured here was made using a red quinoa mix (red quinoa, amaranth, and millet). I also added grape tomatoes because they’re sweeter, crispier, and don’t get lost in the salad like their larger counterparts. Also, I use organic corn – I mention corn specifically because it is one of the most genetically modified foods grown today, along with wheat. So try your best to get organic corn even though it’s more expensive which makes no sense to me but anyway. When you can go organic and local, do it. Free from: dairy, egg, peanuts, tree nuts, soy, wheat, gluten, mustard, fish, shellfish, sugar, animal products, animal byproducts. In a small mixing bowl, add oil, cilantro, vinegar, zest and juice of lemon/lime, garlic, and mix very well until it emulsifies. 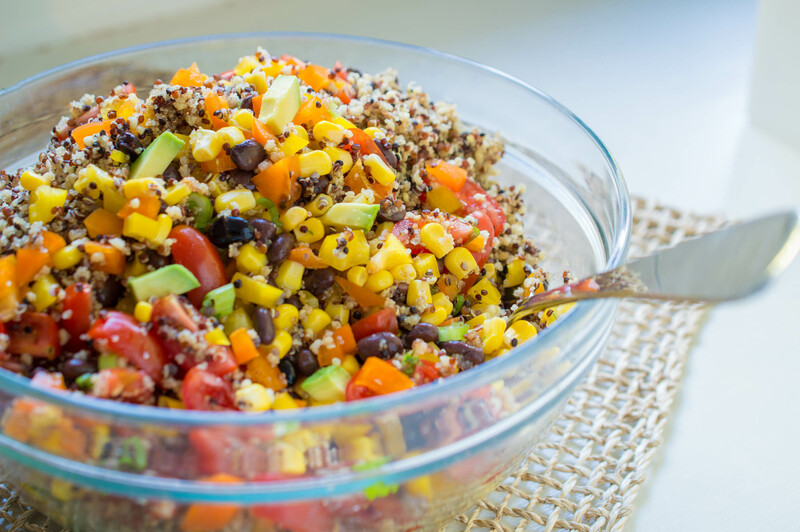 In a large bowl, add cooked quinoa and the vinaigrette. Add remaining ingredients with the exception of avocados, along with some salt and pepper. Using a spoon, toss the ingredients together - ensuring you scoop from the bottom to incorporate the vinaigrette with the rest of the vegetables. Adjust salt and pepper if needed. Add avocado and gently toss into salad. Enjoy immediately*. Refrigerate what's left over. If you're not planning on eating the salad right away, do all the steps but reserve the avocado until ready to serve. Cover with saran wrap and place in the fridge. Once you're ready to serve, add the diced avocados and gently toss into the salad being careful not to crush them. Enjoy!